It's been a slow week for Mac news - and next week will be even slower. Low End Mac will be closed between Christmas and New Year's Day. Publication will resume on Tuesday, January 3, 2007. The biggest news is that Apple is gaining Mac users in droves. Apple sold a record 4.7 million Macs in 2005, is on target to sell 7.7 million (a 60% gain!) in 2006, and is being projected to sell 9 million in 2007. It's hard to believe that ten years ago everyone was wondering if Apple was even going to survive! 9 Million Macs in 2007? "Last week, Gene Munster from PiperJaffray said he expects that Apple will keep growing in 2007 due to improved availability of Macs, the expanding customers footprint and, of course, the new ability of Mac OS X to run Windows on Apple computers." "If Apple keeps growing this way and achieves an average of 3.5 percent for the next year, the sales will go up to 9.01 million units...."
Link: 9 Million Macs in 2007? "If you talk to a hard-core techie who's a user of the Linux operating system or one of the zealots who worship Apple's Macintosh, you won't hear many nice things said about Microsoft. "These responses, of course, are from geeks. For the most part, the average user doesn't even think about Microsoft - he or she just fires up the PC and gets to work or play. "But that may be changing. "Increasingly, I'm hearing real discontent from the masses about Windows, and it doesn't have much to do monopolistic practices, ripping off ideas or a lack of innovation. PR: QuikDrive by US Modular is a portable flash storage drive which allows you to easily store and transfer files via the USB port on any computer. QuikDrive is proudly assembled and packaged in the USA, and is Windows and Mac compatible. Imagine having your hard drive from your personal computer with you on the go, in the palm of your hand. You could store, transfer, and carry your data with you wherever you go! Once plugged into the USB port, US Modular's QuikDrive is detected by any computer and recognized as a removable disk. You may start saving/transferring your business or personal data just like your computer's own hard drive. No external power supply is needed. No driver is required for Windows XP/ME/2000, Mac OS 9.0, and Linux 2.4.2 or Later. PR: Iomega Corporation has announced new versions of two of its versatile storage products: the high-end Iomega UltraMax Desktop Hard Drive with expanded capacity to a towering 1 TB, and a new stylishly black small form-factor Iomega dual interface Portable Hard Drive with 120 GB of storage capacity. Designed for Mac OS X users, Iomega's popular UltraMax Desktop Hard Drives deliver secure, high-capacity storage in a rugged enclosure that complements the Apple Mac Pro and Power Mac series of computers. With RAID 1 and a built-in FireWire and Hi-Speed USB (USB 2.0) hub for future expansion, Iomega's UltraMax Drives excel in digital content creation, graphic design, and other disk-intensive tasks. "Apple's Mac Pro is a thoroughbred personal computer that needs an external storage system that can keep pace," said Peter Wharton, Vice President of Marketing, Iomega Corporation. "With FireWire 800, the Mac HFS+ file system, and RAID 1 performance, Iomega's new UltraMax drive has incredible power right out of the box, and its interface choices and RAID options will enhance your workflow whether you're connecting it to Mac Pro, an iMac, or a MacBook." In addition to the default mode of RAID 0, which stripes data across the UltraMax drive's two 7200-RPM SATA hard drives, other drive settings include RAID 1, 'spanned' (both hard drives are treated as a single volume), and 'simple' (each hard drive is treated as its own drive letter). For ease of use, the new Iomega UltraMax Desktop Hard Drive has a manual RAID switch, allowing the user to turn off the RAID configuration and use the drive configured as JBOD. The Iomega UltraMax Hard Drive is preformatted with Apple's HFS+ file system for Mac OS X users. HFS+ makes more efficient use of large hard drives and supports journaling under Mac OS X, which makes it easier to recover data in case of a problem. The stackable UltraMax drive enclosure complements the new Mac Pro series of Apple computers as well as the older Power Mac series. The enclosure is metallic grey with a mesh grill, an echo of the Mac Pro computer's industrial design. Its three interfaces include FireWire 800, FireWire 400, and Hi-Speed USB (USB 2.0), and it provides users with a three-port Hi-Speed USB hub for easy expansion. Cables for FireWire 800, FireWire 400, and USB 2.0 operation are included with the drive. Fashionably thin at just 0.5 inches (12.7 mm) and an incredibly light 5.8 oz. (163 g), the Iomega Black Portable Hard Drive 120 GB Hi-Speed USB 2.0/FireWire is packed with ideal features for mobile users. It is the perfect storage companion for your Mac notebook, including host-powered operation and Drop Shock technology. The drive's 2.5" hard drive delivers fast 5400 RPM performance and comes with both FireWire 400 (1394a) and USB 2.0 cables. "Host-powered products are great for mobile users because they eliminate the need to bring along a power adapter and find a wall outlet for it," said Wharton. "The Iomega Black Portable Hard Drive gets all the power it needs from the USB or FireWire cable. Choice of connectivity combined with 120 gigabytes and a stylish little package make the new Iomega Black Portable Hard Drive an ideal portable hard drive for road warriors and others that need more freedom and versatility in their storage products." Other travel-friendly features include the use of industry-leading EMC Retrospect Express backup and disaster recovery software for improved data security. In addition, Iomega's Drop Shock technology provides enhanced durability by helping protect both the drive and its data from unexpected bumps and jolts. A single Iomega 120 GB Dual Interface Black Portable Hard Drive can hold up to 480,000 photos, 2,220 hours of music, or 180 hours of video***. For secure storage and worry-free backup and disaster recovery, Iomega also includes EMC Retrospect Express software with the new UltraMax Drive and the new Black Portable Hard Drive. Retrospect Express delivers automated, reliable, cost-effective protection for Windows and Mac users. Its award-winning design makes it easy to set up and manage highly efficient backups on any personal computer, greatly simplifying disaster recovery. Users can back up open files, verify backup integrity during the backup, have scheduled backups proceed even without logging in, and recover individual files or a complete system to any point in time. 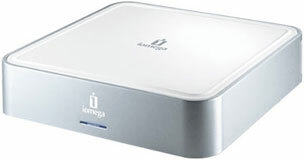 The Iomega UltraMax Desktop Hard Drive 1 TB Triple Interface is compatible with Mac OS X 10.1 or above on Apple computers with an Intel processor or G3 processor or higher. The UltraMax Drive can be reformatted to NTFS or FAT32 for use with a PC (instructions included), making it compatible with Microsoft Windows 2000, Windows XP Home and XP Professional editions, as well as the upcoming Windows Vista. FAT32 format allows cross-platform use. The Iomega Portable Hard Drive 120 GB Hi-Speed USB 2.0/FireWire is compatible with Mac OS X 10.1 or higher, as well as Windows 2000 Professional/XP Home/XP Professional and the upcoming Windows Vista. The Iomega UltraMax Desktop Hard Drive 1 TB FireWire 800/FireWire 400/USB 2.0 with Hub is available now for $499.95. The Iomega Portable Hard Drive 120 GB Hi-Speed USB 2.0/FireWire is available for $189.95. Both products are currently available worldwide. PR: Iomega Corporation has enhanced its external storage solution for Apple's Mac mini computers by doubling the capacity of the Iomega MiniMax Desktop Hard Drive USB 2.0/FireWire from 250 GB to 500 GB*. The stackable Iomega MiniMax Drive keeps the same great features that endeared Mac mini users to the original MiniMax Drive, including a three-port USB 2.0 hub, three FireWire ports, a smart power switch that powers up and down in tandem with the Mac mini, and an interactive cooling system with thermal probe that automatically regulates fan speed. The Iomega MiniMax 500 GB Drive measures 6.5 inches square and 2 inches tall. It has the same footprint and matches the industrial design of the Mac mini. Its 7200 RPM hard drive with 8 MB cache adds 500 GB of storage to the Mac mini's internal 60 GB or 80 GB native capacity. And with Dantz Retrospect backup software included, Mac mini users get hassle-free backup and data recovery to secure their files, photos, songs, and other data. A single MiniMax 500 GB drive can save up to 2,000,000 photos, 9,250 hours of music, or 750 hours of video**. "Iomega's MiniMax Drive is a fun, useful addition to the Mac mini that instantly improves data security along with data storage capacity," said Peter Wharton, vice president of marketing, Iomega Corporation. "The 500 GB MiniMax complements the great features of the Mac Mini and creates a versatile platform that can organize and protect any user's digital movies, photography and music. And that's what Mac users really want - more capacity, more security, ease-of-use and a visually attractive product. The new 500 GB MiniMax delivers on all of those user preferences." The Iomega MiniMax 500 GB Desktop Hard Drive is compatible with Macintosh G3 or greater (blue and white G3 only), iMac or Mac Mini computer with built-in USB connection and Mac OS 10.2 or above. The Iomega MiniMax 500 GB Drive can also be reformatted for use with Microsoft Windows 2000/XP Home or Professional; instructions included. The Iomega MiniMax 500 GB Desktop Hard Drive is available for $279.95 from iomega.com and select online and Web retailers. The product is currently available in Europe, as well. PR: Microsoft introduced a new file format in Office 2007 called the Microsoft Open Office XML Format (.docx). This format is not compatible with older versions of Microsoft Word or with alternative operating systems like Linux or Mac OS X. Nor is it compatible with other word processing applications like OpenOffice, Lotus 123, or NeoOffice. The Docx Converter dashboard widget allows you to convert files right from your desktop. Simply drag the .docx file you want to convert into the drop area of the widget (click to drag, push F12, drop), and the widget will automatically convert the file and save it to the location of the original file (with a .htm extension) and (optionally) open it in your browser. Best of all, any updates or feature additions to the website will automatically be reflected in the widget!